With more than 100 activities included in the cost of the admission button ($10 adults/$5 youth), it’s easy to fill up multiple days with land-based activities like concerts, fair-fabulous food and cultural experience during the nine-day Wichita Riverfest, June 2-10 in downtown Wichita. We’ve even put together several sample Riverfest itineraries for families, couples, guys and gals to hit the festival running. But let’s not forget the river in Riverfest! 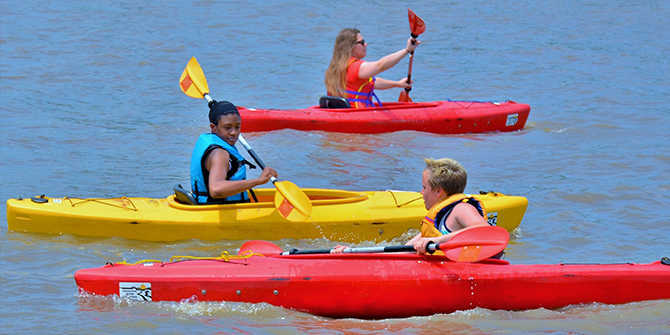 This year’s theme is “River Madness” and there are plenty of ways to enjoy the Arkansas River during the festival: either by getting on the water or watching events taking place on the water. One of our favorite activities that only happen during Riverfest is the Wagonmasters River Tours. Even for those familiar with the area, it’s a fun ride and a rare chance to get photographs of the Keeper of the Plains and Exploration Place from the waterway. A decked-out pontoon boat takes passengers up to the Keeper of the Plains and back while a Wagonmaster spins a tale about Water Wagon Willie and Admiral Windwagon Smith. The story is “a mix of fact and fable – you decide which is which” and highlights activities for visitors in the river area, including the Historic Delano District, the Veteran’s Memorial Park, the river troll and the museums on the river. The 20-minute tour starts underneath the Douglas Street Bridge and is free with a button. The tours run daily: 4 to 8 p.m. Monday-Friday, noon to 8 p.m. Saturday-Sunday June 3/4 and noon to 5:30 p.m. on the final Saturday, June 10. Monday-Tuesday 2 to 8:30 p.m.; Wednesday-Friday 5 to 8:30 p.m.; Saturday, June 3, 11 a.m. to 3 p.m.; Sunday, June 4, 3 to 8:30 p.m.; Saturday, June 10, noon to 5 p.m. Enjoy the Arkansas River aboard two-person paddle boats. Saturday, June 3, 11 a.m. to 3 p.m. and Sunday June 4, noon to 5 p.m. Participation may be subject to conditions, restrictions and prohibitions. Find complete details at arkrivercoalition.org. This new event is one you won&apos;t want to miss as teams race the Arkansas River in stock tanks! Cash prizes will be awarded for the top three finishers as well as best decorated tank and costumes. To enter a team, visit WichitaRiverfest.com, and even if you don’t have a team it’ll be a blast to watch from the banks. Saturday, June 3, 3 to 9 p.m. and Sunday Jun. 4, 11 a.m. to 2:30 p.m.
Head to the Arkansas River with your blanket and sunscreen to watch rounds one and two of the IJSBA Mid-America Watercross Championships. Racers from across the nation will be challenged by the most difficult course in this year’s series. Build a river-worthy vessel in 90 minutes or less with cardboard, duct tape, pool noodles and a box cutter. No team size limit, but at least one team member (ages 12 or older) must ride in the vessel. Awards for fastest time, best design and most spectacular sinking. Cost is $20 per team. Enter at WichitaRiverfest.com or plan to watch (and laugh) as the teams attempt to launch their vessels. Wednesday, June 7, 6 to 7 p.m.
Rev up your pedal power for some friendly competition during the Paddleboat Races as two-person teams compete for prizes and glory! Saturday, June 10, 9 a.m. to 1 p.m. Location: starts from Ralph Wulz Riverside Tennis Center, 551 Nims St.
Wichita Rowing Association returns competitive rowing to Riverfest with an exciting "Stake Race" regatta on the Little Arkansas River. Experienced men and women rowers will race from South Riverside Park to Greiffenstein Bridge and back. Watch from the banks of the Little Arkansas River or from bridges as rowers vie to be the first to make the turnaround at the stake and back to the finish. Saturday, June 10, 2 p.m.
Canoe races are back! One of the original events from the very first festival in 1970 makes its return. Paddlers will start north of the tennis center on the Little Arkansas River, race upstream to the turn around point at 13th Street, then it&apos;s a mad dash back to the finish line under the bridge at Nims and Stackman Drive. Entry is free, but teams must supply their own canoe, oars and flotation device. To enter a team, visit WichitaRiverfest.com. Saturday, June 10, 6 to 8 p.m.
It&apos;s a race to the finish line! Vie for a chance to win cash and prizes. Entry fee is $5. Saturday, June 10, 10:15 p.m. The Clean Streams organization presents this closing night event: a river parade of boats festooned with lights. If you would like to enter a boat and get the chance to watch the closing night fireworks from your anchored vessel, visit WichitaRiverfest.com for details and entry information. Spectators will want to arrive early to stake out their viewing spot for this event, followed by the Capitol Federal Fireworks Finale that starts at 10:30 p.m. Please note: River activities are dependent on the weather and river conditions each day; watch WichitaRiverfest.com for updates. We’ve done our best to verify dates and times of Riverfest events, however it’s always best to check WichitaRiverfest.com for the most updated concert and event information. Buttons are $10 for adults, $5 for ages 6-12 and free for kids 5 and younger. Buttons can be purchased in person at area Dillons and QuikTrip locations, as well as at the Wichita Festivals office, INTRUST Bank Arena box office or at the festival gates.